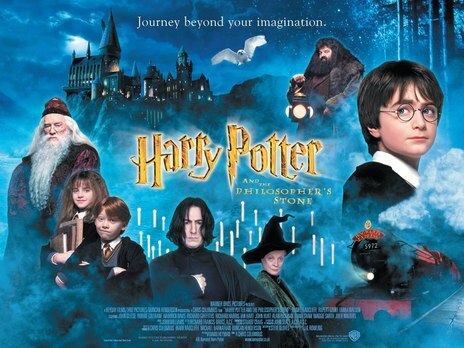 Harry Potter and the Philosopher’s Stone (2001) – Movie Review – Another Movie Blog! Harry Potter is my generation’s Star Wars. You could argue that it’s Lord of the Rings, but with this analogue I would compare their relation to the latter being like Star Trek (right down to the nature of the fanbases). People our age might know of someone not steeped in Tolkien knowledge, but I doubt you can find anyone who doesn’t know the basics of this saga. It is part of our shared experience. We have grown up with these films as children. For many, the books got them into reading. They are a new great myth. Which is why it is interesting to go back to these films with more adult eyes, knowing things about film and also the kind of Campbellian sources JK Rowling was pulling from, as we now watch this saga fully formed and complete. The biggest strength of these films is one that the filmmaker’s did not originally foresee; that we would see the actors’ grow up along with us. As we matured, so did they, and so did the story. But for now, for the first film, it is mostly full of kiddy wonder. And it’s in that tone that the film find’s its greatest moments. The Philosopher’s Stone is not my favourite of the series, in fact looking back now I have a fair amount of problems with it, but next to the third film it is the one I have seen the most times, because it is the thorough introduction to this world of wizardry. The production design here is absolutely incredible, and the way we see these places through child eyes creates the films most lasting images: Diagon Alley; Platform 9 3/4; the Great Hall scenes. This is also helped by one of John William’s greatest scores, from the themes that we now all just know to quieter moments in Oliverander’s wand store, that just oozes atmosphere into a film already full of such. Daniel Radcliffe can be stilted at times in this movie – though he would get better – but his wonder filled eyes, and that of the rest of the casts, sell the hell out of this realm, and you rarely find yourself questioning it. Speaking of the cast, is this perhaps the greatest ever casting job in movies? Susie Figgis and company had to plan out an ongoing series, and pick actors who would suit the part for a decade. And apart from one or two re-castings of those no longer suited to the part, there were a lot more re-castings done for actor’s who would die between the saga’s shooting. Apart from giving us this world, one of the greatest things Rowling did was force the studios to higher only British Actors. This is not just true from an economic perspective – the UK is now a powerhouse for blockbuster productions – but to the wealth of big stars in this movie, all of whom turn in great performances in bit parts: Maggie Smith; Robbie Coltrane; John Hurt; Julie Walters; John Cleese, and those who have since past like the delightful Richard Griffiths, the great Richard Harris (still, to many, the Dumbledore, though I do love Michael Gambon) and of course the unbelievable gravitas of the recently deceased Alan Rickman as Snape. And although some of the child acting is stilted (“Wow, Look at it! the new Nimbus 2000! It’s the fastest model yet!”), the future strength of this series is its main cast. Of the two main cast Emma Watson and Tom Felton seem to be the most naturally talented from the outset, but seeing the actor’s joy in scenes coming through their characters really sells your joy of Hogwarts. It is often said that 90% of directing is casting, and in that respect 90% is beautifully directed. It’s with that last 10% that most of my faults lie. Chris Columbus did a fine job with the actors and setting up the series for other directors, but he has never been what you call a cinematic stylist. At worst you could call him an accountant director. At one point Terry Gilliam was going to direct this movie and the series, and of the whole movie’s I only think the third one holds that kind of tone. Chris Columbus is no Terry Gilliam, and while that this unfair to the guy he also doesn’t sell his “Chris Columbus”. Scenes just play out in standard coverage, we are plonked from one set piece to the other in the simplest way, and the only time there’s a montage in this movie is because the chess scene would be really boring to see in full.. Now the production design is such that the world is still very immersive, but sometimes the flat direction makes the sets feel like sets (Gringotts looks like the rollercoaster ride it is meant to be, and I think you can see the spurts the flames come out of in the end). On top of that, while the episodic feel of these movies is part of what makes the world feel so lived in, some inclusions feel too faithful to the novel, and with the two and a half hour run time the plot kind of lingers and repeats itself. I can’t say I have ever been bored by this movie, but until the last forty minutes there’s no real propulsion to the grander story of the Philosopher’s Stone (and that last forty minutes really lays it thick on the schmaltz). But everything is so fresh and new that staying faithful to the book is not the biggest detriment (that would be the next film). Oh, I love Quidditch in Rowling’s world, but in the movie’s it comes across like the pod-racing scene in Phantom Menace; exciting, but doesn’t go anywhere (I know that’s in the book, but this isn’t a book). So whilst Harry Potter and the Philosopher’s Stone does not start the series with its best film, it set the grand stage for everything to follow in a satisfying way, even today. I can’t lie and tell you that my memories of seeing this in the cinema at seven years old doesn’t colour my perceptions in some way, but the world of Hogwarts created is one you could snuggle yourself into from the outset. And we would have a lot time to spend in there.